Escape to jungle serenity at our Lanna Resort. 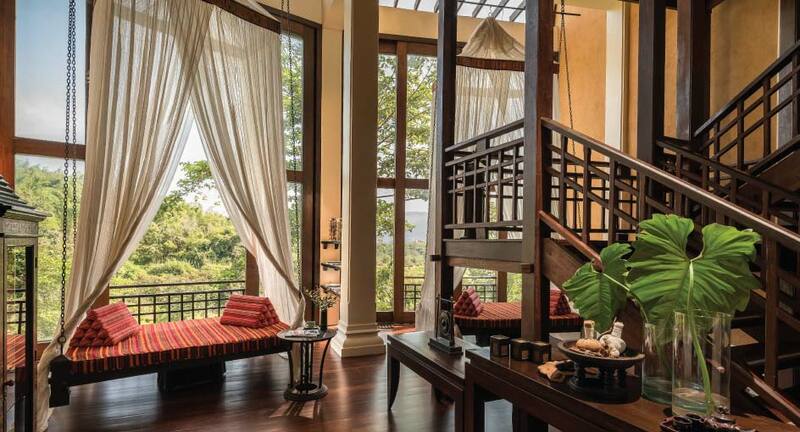 A three-storey open-air pavilion greets you, the scent of lemongrass in the air. Ascend to your teak wood suite overlooking three countries. Unwind with a milk bath for two, before succumbing to side-by-side massages. The spa menu at our Lanna resort draws on centuries of northern wellness traditions, as well as indigenous and medicinal ingredients. Walk to our rice paddy pavilion for yoga and massage experiences in a lush setting. Relieve tiredness and tension with a traditional Thai massage of stretching and pressure point techniques. A heated herbal compress is rolled over your body using healing moringa oil. Nurture youthful radiance with anti-ageing golden silk to balance, deeply nourish and moisturise. Plai, or poo loey as it is known in the north, is a ginger species revered for its ability to cool inflammation and combat joint and muscle ache. Submit to a healing massage while also calming, cleansing and nourishing skin. The spa was one of the best I've been to in the world and is a MUST. The package includes a "discovery" for each night booked...amazing massages at the beautiful and luxurious spa. I wanted a romantic surprise to end our honeymoon. It only took a few words for the staff to set this is in action. They designed an intimate spa experience that was an exclamation point to our trip.